It is a hard truth that you will lose some temperature during your mash. 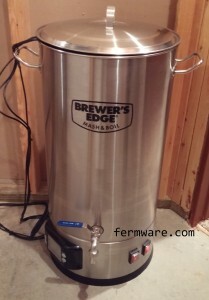 In my desire to go electric, I recently purchased the BREWER’S EDGE® MASH & BOIL from William’s Brewing. 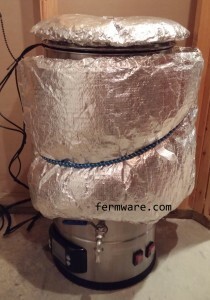 Without actually even having brewed a batch of beer on it yet, I already got to work figuring out how to insulate it. 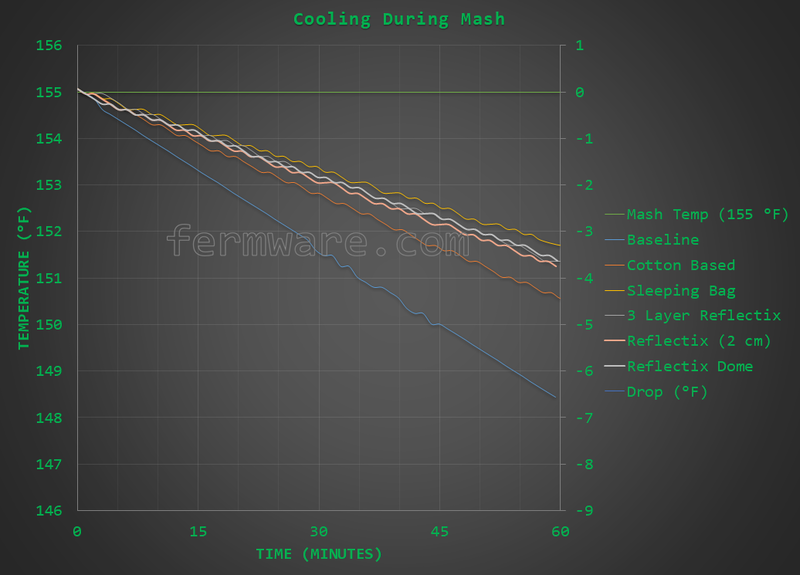 I tested various insulation methods on the Mash & Boil, but the relative comparisons should be valid on any mash tun. A post with a better review of the Mash & Boil and my reasoning for wanting to go electric will come at a later date. Just a read for you fortunately. It took me about a week to perform the experiments. One of the advantages of an electric brewing system should be accurate temperature control. With such a new system as the BREWER’S EDGE® MASH & BOIL, there is a lot of discussion about the 6 degree swing in temperature control. 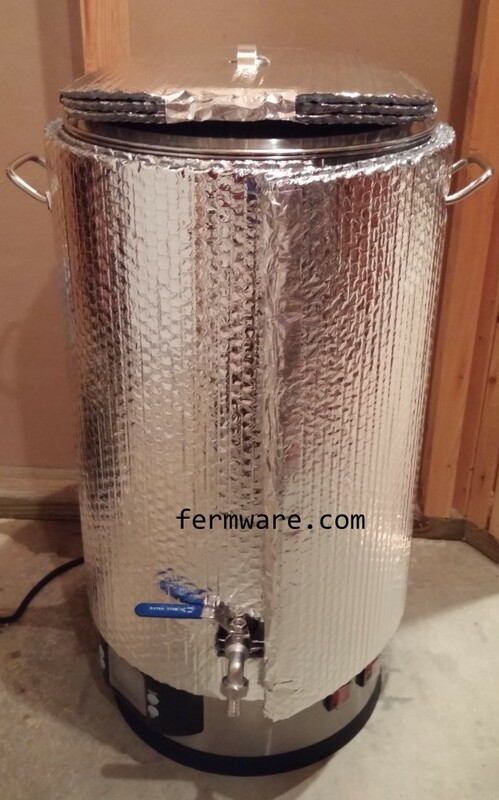 This is pretty well contrasted with much more expensive systems as the Grainfather or PicoBrew Zymatic that may hold temperature within a degree or two. 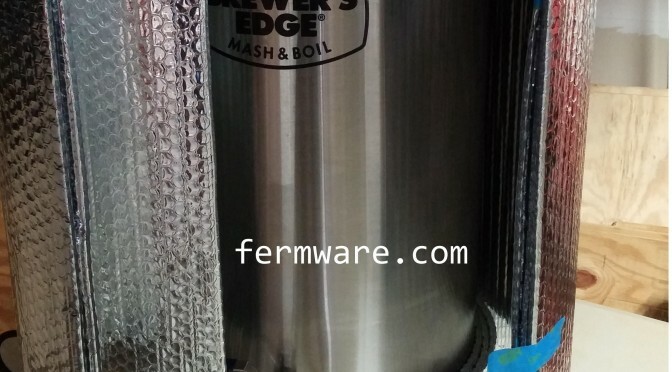 While I do agree this could and should be safely regulated to a tighter temperature band on the Mash & Boil, I would at least propose that the first line of defense is just to insulate your mash tun so that accurate temperature control is not as critical. In all reality, this is a turn-key electric brewing system for less than 1/3 the cost of the other systems on the market. 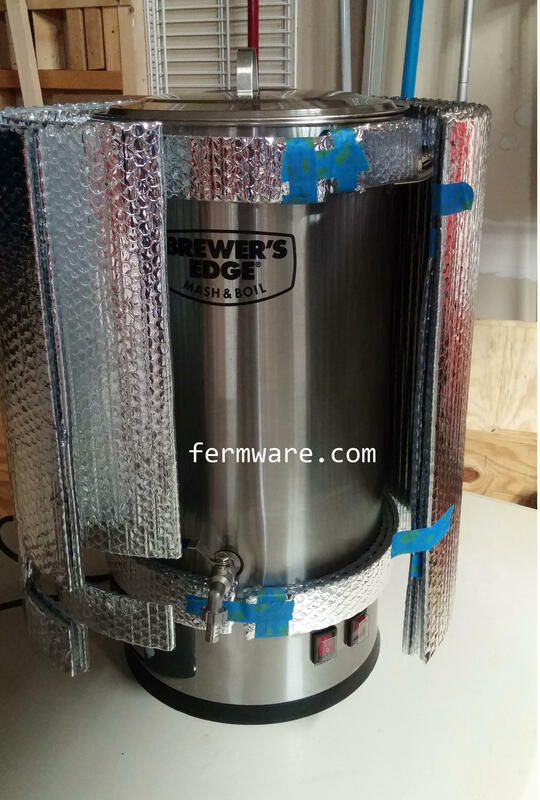 I initially started brewing with a 44 Qt kettle doing 5 gallon batches with a propane burner. 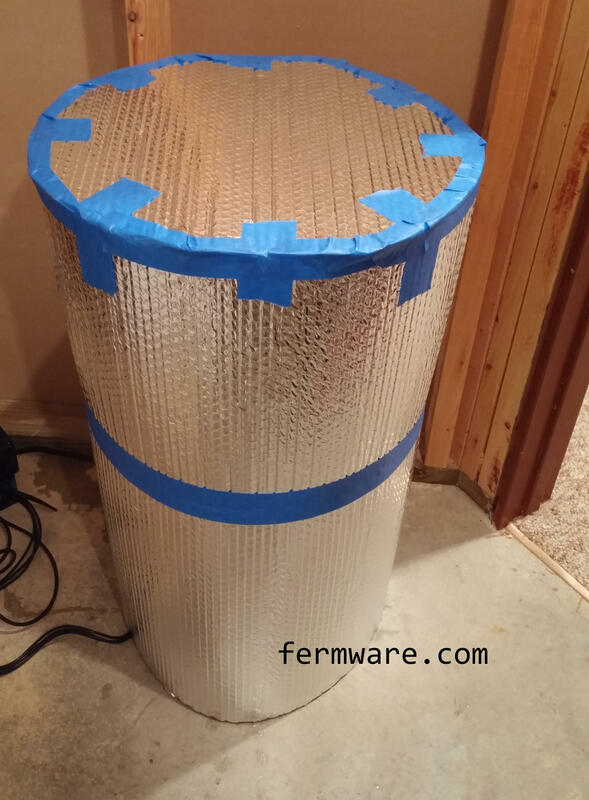 I did notice a decent amount of temperature loss, so I created a thermal wrap to use during the mash. 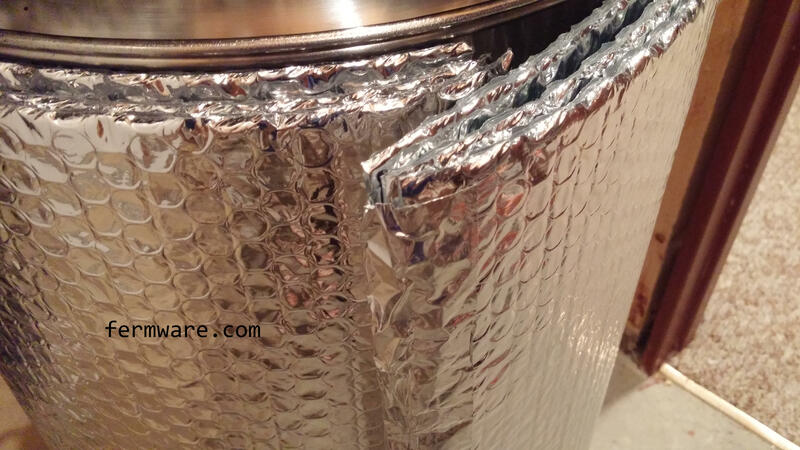 This was made using some cotton based insulation meant for water heaters. I did not want to mess with fiberglass based insulation. 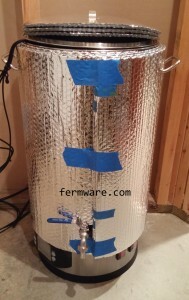 When I moved to a 62 Qt kettle and larger batches, I think the larger thermal mass helped maintain temperatures better, but I went ahead and used the same wrap anyway. With the new system, it had such a different diameter to height ratio, I decided to start from new again. Since we homebrewers are a thrifty bunch, it usually comes down to whatever we had on hand at the time we needed to create it. This time for me, however, I had enough time to plan it out and (gasp) actually test it before using it. 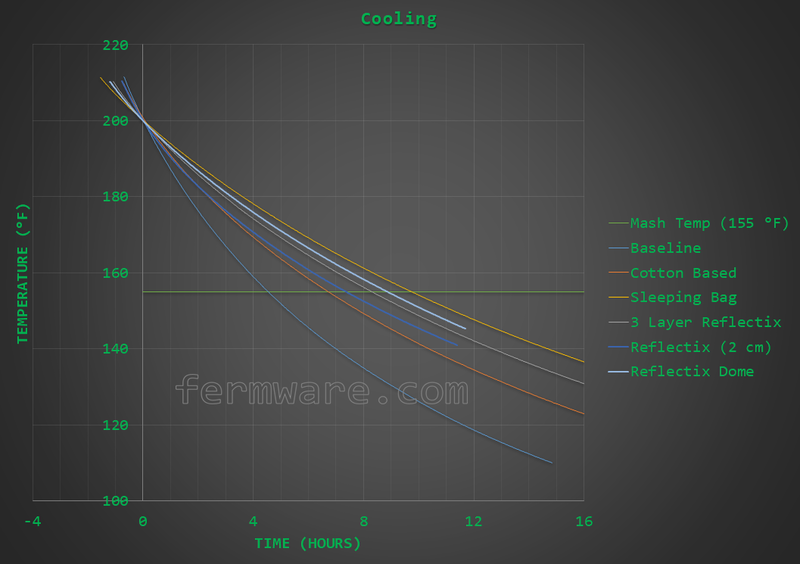 As stated before, these results should be applicable to any mash tun that adheres to the laws of thermodynamics. These results are relevant to a mash because the only thing that will change will be the specific heat of the mixture. So the best insulation with water will still be the best with grain in the mash. 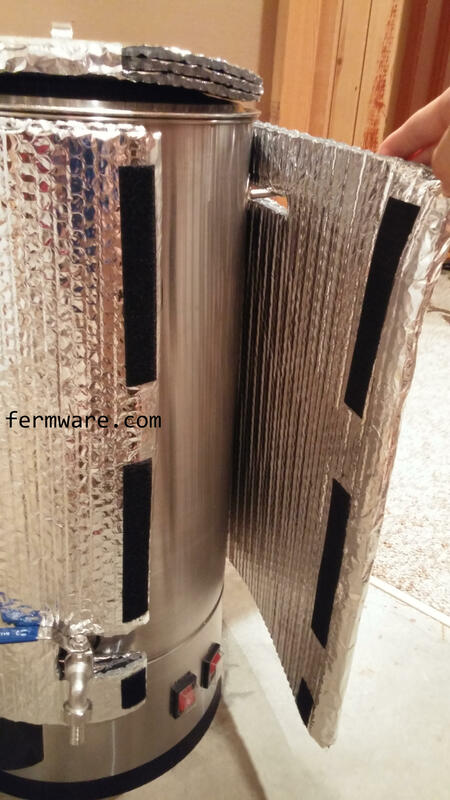 After my first post (part I) there was some discussion online and in forums surrounding the lack of air gap between the outer layer of Reflectix and the kettle in my testing. As an engineer, I’d like to think that my test methodology is 100% comprehensive. Also as an engineer, I’m always willing to accept that I might be wrong and the best way to do that is to attempt to prove that I am wrong. I then ran variations of the Reflectix configuration only and posted them in (part II). 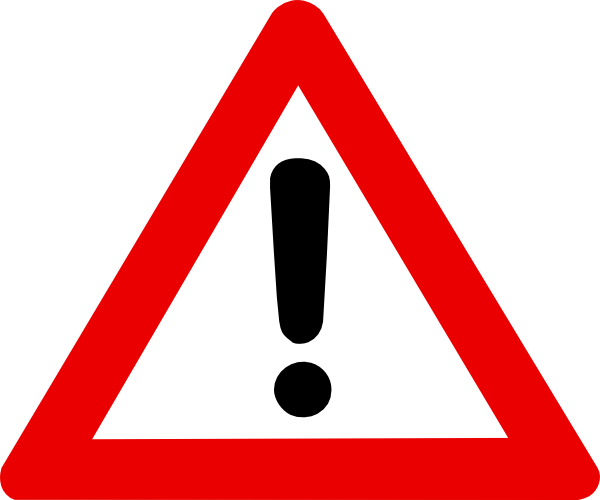 This post is a combination of (part I) and (part II) so that one can get all the information at once. 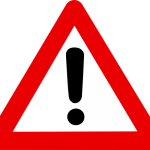 If you wish to read them as well, go ahead, but ALL the information from both posts has been combined here. If future testing is taken on, this post will be updated and serve as the master record. I wrapped the sleeping bag all the way around the kettle once and then had enough length left over to do a sort of “comb over” on the top of it. I finished it off by holding it on with the bungee cord. Then I used the 3 layer baseline Reflectix jacket wrapped around it. Having thought of the sleeping bag winning out big time, I wondered if it was due to the superiority of the sleeping back insulation properties or the fact that with that test, the entire kettle was surrounded (top and sides) with the sleeping bag. Whereas, with the other insulation methods, there was a gap for practicality purposes between the lid insulation and the wall insulation. I questioned whether this open gap was allowing more heat to escape. I constructed a dome that encapsulated the entire kettle. The diameter was about 18″ (about 2.5″ air gap to the kettle surface) and the height was 28″. I have not modified the Mash & Boil in any way. I just used the unit in stock condition and let the temperature controller do it’s thing to get the water up to temperature. I used exactly 6 gallons of RO water for the experiment. The kettle was placed in my basement storage room, which maintained a consistent 65 degF throughout the testing. I had 3 temperature probes in the kettle. One at 1″ from the bottom, then another 6″ up and another 12″ up. This was a nice spread for 6 gallons of water. In reporting temperatures in this experiment I am only using the temperature sensor at the 6″ height. The other sensors were a proof of concept for some future testing I plan to carry out. I did see some stratification in the temperatures over time as the water cooled, but for consistency, I chose the 6″ probe. To start the each test, I topped off to 6 gallons and set the Mash & Boil to 215 degF and let it ramp up. As soon as the system was boiling, I turned it off and unplugged it from the wall. Temperature measurements were taken approximately every minute. I allowed the temperatures to cool to somewhere around 100 degF or as long as I could stand it. Absolutely no stirring or opening of the lid occurred during the cool down. The critical stage in the test was when the water cooled to 155 degF. At that point, marker would be taken and then compared to the temperature exactly 60 minutes later. This would be indicative of a typical mash temperature and the relative temperature loss during the mash. Yes there will be different thermal capacities of a water/grist mix, so to reduce the experiment to just the insulation, straight RO water was used. I normalized the cool down datasets so that the start time (t=0) was the same for each configuration at 200 degF. 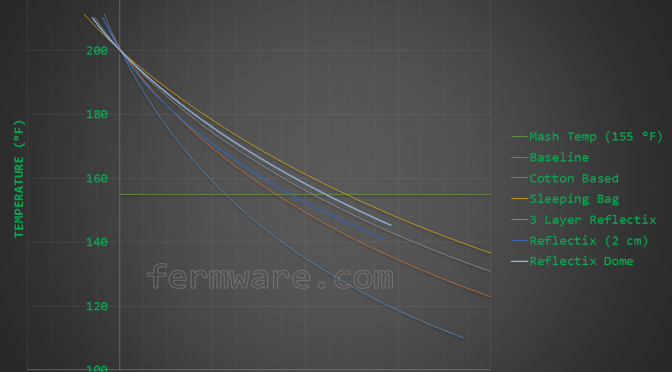 As a visual reference aid, I placed a line at 155 degF to see what the curves look like near mash temperatures. One can clearly see here that the baseline configuration with no additional insulation decreases in temperature the most rapidly. 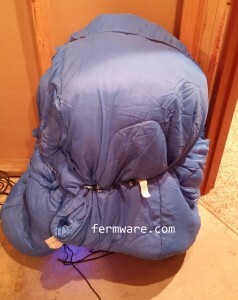 The cotton based insulation is a bit better, then beat by the Reflectix configurations and then the sleeping bag. You can see that the 3 Reflectix configurations are quite close to each other when compared to the rest. This small table places numerical values on the temperature drops through a simulated mash temperature window. I calculated these temperature drops by taking the very last data point that was greater than 155 degF. Then I grabbed the next data point that was +60 minutes from that initial point. The values shown are then the differences between those two temperatures. To glean even more from the data, I plotted the 3 different configurations only through the mash temperature window. 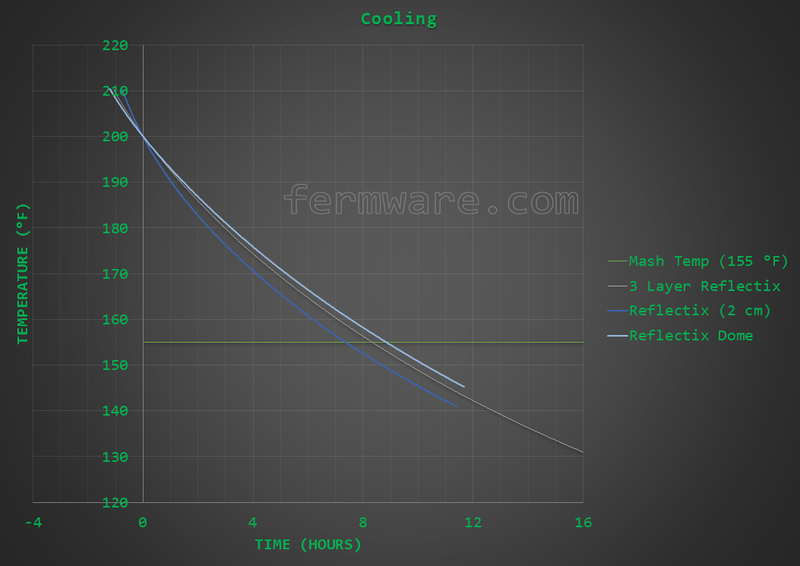 I normalized these curves so that the start time (t=0) was the same for each configuration at 155 degF The left axis shows the actual temperature reading, while the right axis shows the temperature drop, relative to the 155 degF starting reference temperature. I also placed a helper line at 155 degF. If you are to accept the belief that most of the conversion is done within the first 15 minutes of the mash, all of the Reflectix and Sleeping Bag insulation methods show a drop of less than 1 degF within the first 15 minutes. The extended time plots do show the dome to be the best, followed by the 3 full layers and lastly the 2 cm gap. I am surprised that the recommended method from Reflectix was slightly worse than the full 3 layers. I’ve struggled to come up with a reason, but I think it would require more thought and analysis than I feel like spending on it. It appears that when choosing Reflectix, that you almost can’t go wrong with any of the 3 methods as far as mashing goes. Due to the 0.2 degF difference in temperature drop between the 3 different methods during the simulated mash time, I’d almost call it a tie. However if you want to pull other factors in, depending on your preference, I can add some additional points. I am surprised that the recommended method from Reflectix was slightly worse than the full 3 layers. I’ve struggled to come up with a reason, but I think it would require more thought and analysis than I feel like spending on it. Precisely why I just tested and reported the results. Everyone has their own selection criteria when choosing the best equipment for their needs, so I hope you’ll find the information reported in this post useful. 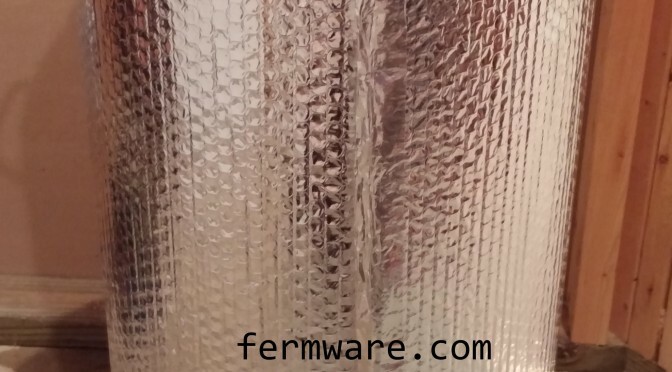 There is something to the gap and whether it is just plain air or air encapsulated in bubble wrap, it is as effective as air naturally is. I’m not suggesting that I do the testing, but I’d be willing to be that if you simply took a bunch of mylar balloons and created a dome as I did (or re-created the other methods), you’d get a similar result. Nothing particularly special about the materials involved, just the application. Definitely adds the most material, but is what I had already made, so for me, that’s what I’m sticking with. Plus I just felt that without the spacer rings, there would be less material to snag on something else. Probably the least amount of material needed and arguably the same performance as the other 2 options. Also a lower amount of material, but for storage, if you want to maintain the shape, it is quite bulky. I would caution against this method if you have electronics or moisture sensitive gauges integrated with your kettle. When using this dome, it gets quite steamy in there and moisture could find a way into the electronics enclosure or gauge. 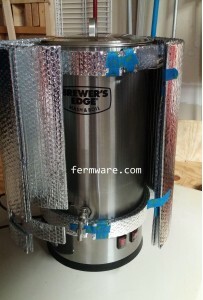 After my previous post Mash Tun Insulation Comparisons there was some discussion online and in forums surrounding the lack of air gap between the outer layer of Reflectix and the kettle in my testing. As an engineer, I’d like to think that my test methodology is 100% comprehensive. Also as an engineer, I’m always willing to accept that I might be wrong and the best way to do that is to attempt to prove that I am wrong. As stated, this is an addendum to the previous post Mash Tun Insulation Comparisons comparing various insulation methods. I normalized the cool down datasets so that the start time (t=0) was the same for each configuration at 200 degF. 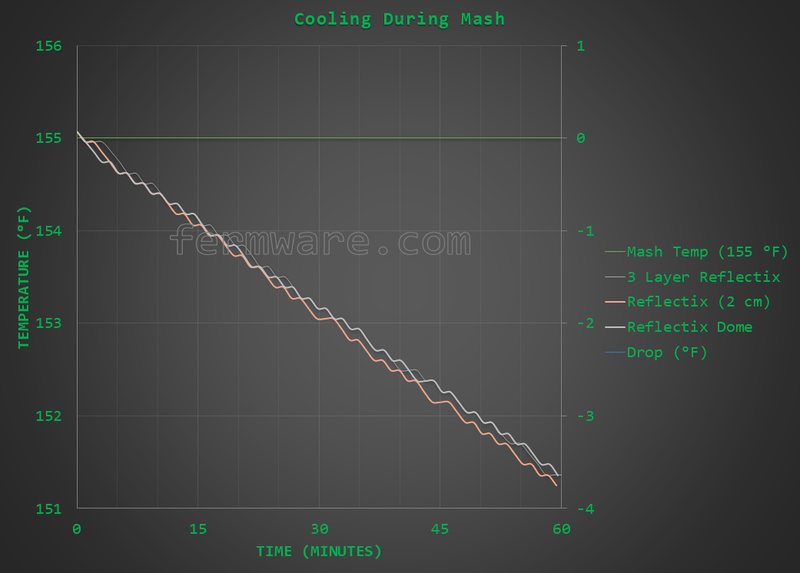 As a visual reference aid, I placed a line at 155 degF to see what the curves look like near mash temperatures. You can see that the 3 Reflectix configurations are quite close, but the recommended gap of 3 layers (2 cm) appears to be the worst of the configurations. If you are to accept the belief that most of the conversion is done within the first 15 minutes of the mash, all of the Reflectix configurations drop by less than 1 degree. Sorry if I offended both SpaceX or NASA employees in one statement. This is pretty easy. It just requires some simple measuring, cutting and taping. The patience portion of this may not be so easy depending on how good you are at measuring, measuring, calculating, measuring, measuring, marking, checking, measuring and cutting. maybe an hour at the most. Depending on how meticulous you are and how many do-dads are sticking out of your mash tun. 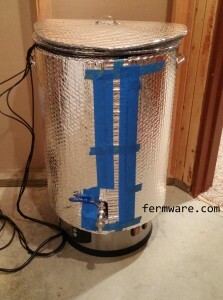 In my last post, Mash Tun Insulation Comparisons I ran an experiment on various forms of insulation for your mash tun. 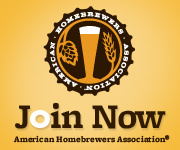 My platform was the new Brewer’s Edge Mash & Boil. Even though the jacket was made specifically for the Mash & Boil, I’m also going to lay out how to measure out your Reflectix insulation jacket. I purchased a 24 inch wide x 25 foot long roll for mine. It is about enough for 6 layers , plus lids on a 12 inch diameter mash tun. I’m only making 3 layers here. I just chose the Reflectix brand, because it didn’t have any writing on it. Utility knife, get a fresh blade. 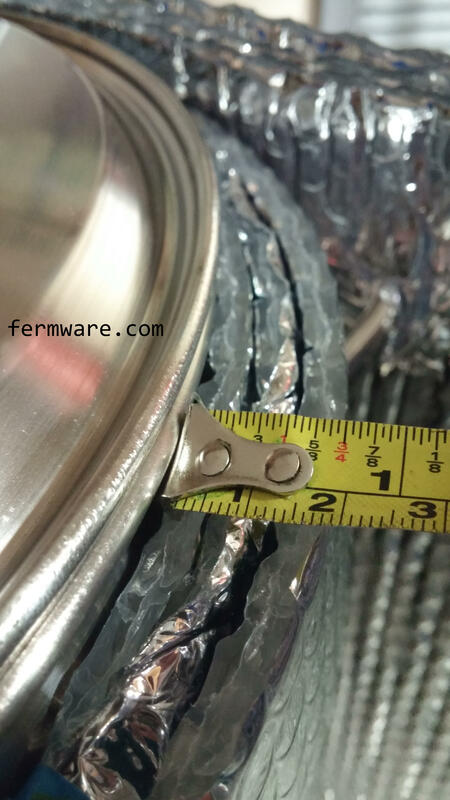 Here are the basic principles of measuring out a jacket for your mash tun. When adding an additional layer, remember that the cutout locations will move further from your reference at each layer, due to the additional diameter added with each layer. 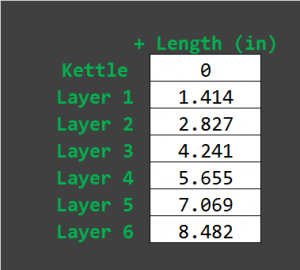 For the Reflectix, it averages out at about 0.225 inches thick, so here is quick table that shows the amount of additional length to add for each layer length to just make it around. If you want to add a tab for velcro, I’d use about 2 additional inches as I did. Then for each cutout, it will be a ratio of the table above, depending on how far around the circumference it it. In all reality, you might outsmart yourself with the math, so there is no shame in just doing it all by hand. Just go one layer at a time, then tape it all together when you are done. For the lids, I just set the lid on top of the Reflectix and traced around it with the utility knife. Then I just cut a little tab to go through the handle on the top. 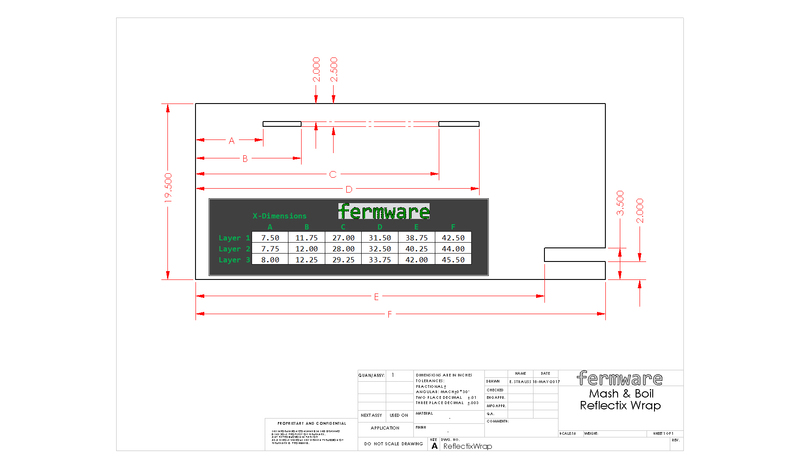 Here is the dimension scheme for a 3 layer Reflectix jacket for the Brewer’s Edge Mash & Boil. Mine sits just on top of the display panel and just under the top lip. I also rounded dimensions to the nearest 1/4 inch to make measuring and cutting easy. I didn’t want to mess with finishing all of the edges, so I just picked key areas. I can always go back and add it if necessary. If you enjoyed this post, check out other posts on the site and be sure to shop through some of the affiliates on this site.